blink(1) mk2 is an updated version of the blink(1) super status light. The original blink(1) made it easy to connect any data source in the cloud or on your computer to a full-color RGB LED so you can know what's happening without checking any windows, going to any websites or typing any commands. blink(1) mk2 maintains backward-compatibility while adding better functionality and great new features. 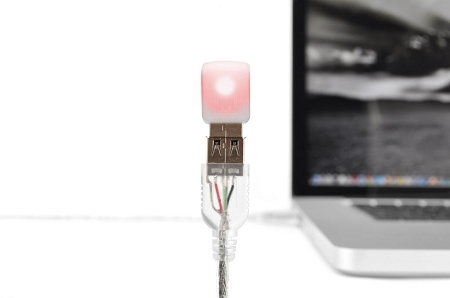 blink(1) is a super status light: it packs three dimensions of information (color, brightness and pattern) into a single tiny package that fits into any USB port on nearly every device. It makes it incredibly easy to connect any data source in the cloud or on your computer to a full-color RGB LED so you can know what's happening without checking any windows, going to any websites or typing any commands. We designed blink(1) in the spirit of our favorite old school Unix tools and we tried hard to make it simple, flexible, and robust. With our Blink1Control application, you can have blink(1) flash when packages are delivered, when you get new mail, when a meeting is about to happen, or anything else that IFTTT can do. With our command-line tools and APIs in just about any computer language you like, you can hook up blink(1) to flash on server status, patch updates, disk usage, or anything else that can be monitored. Multiple blink(1)s can be used on a single computer, letting you assign each one to a specific bit of information. Get things done without having your face buried in the computer. If you're expecting a call and don't want to make noise, blink(1) can help. Monitor network speed when you're in the cafe, so you know when the guy in the corner is seeding on BitTorrent and it's time to go elsewhere. Ever wanted a physical "Busy" indicator for your cubicle or office? With blink(1) and a USB extension cable, you can let your coworkers know when you really can't be interrupted. And because blink(1) is physically unobtrusive and requires no drivers to confound the OS, it makes a great multi-modal notification light for rack-mounted servers, alerting to task updates or system alerts. blink(1) is a USB HID device, so no special drivers are needed, just applications. We provide apps for Mac OS X, Windows, GNU/Linux, and embedded Linuxes like those used on Raspberry Pi, BeagleBone, Arduino Yun, and OpenWrt. The name "blink(1)" is a play on the Unix help system ("man pages") where command's help pages are given by their name and section. Not only are the blink(1) tools and apps open source, so is its entire design. Feel free to hack it to make it do cool new things. blink(1) is open source hardware. Q. What's in the box? A. Each blink(1) mk2 comes with the blink(1) mk2 unit itself and a clear 5ft USB extension cable so you can place the blink(1) mk2 in a location of optimal visibility. Q. Wait, so this is just an RGB LED with a USB connector in a case? A.Yes, and it's the most flexible and easiest to use one, anywhere. To make it all work, there's also a tiny USB controller with our firmware to make it easy to program and control, but basically yes. Q. Which computers does blink(1) work with? A. Just about anything with a USB jack. 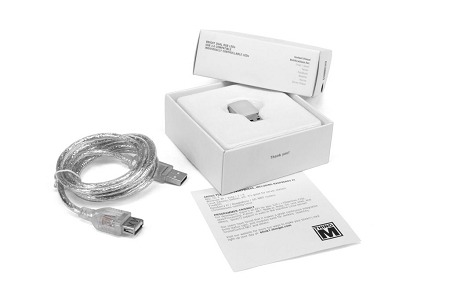 Specifically, blink(1) is a USB HID-compliant device and the apps we release for it work on Mac OS X 10.7+, Windows Vista+, Ubuntu/Debian-style GNU/Linux. The command-line tools can be compiled for just about any POSIX-compliant Unix-style platform including the Raspberry Pi, DD-WRT WiFi routers, BeagleBone, and some Android phones. Q. Can I hook it to my Twitter? A. Yep! Our BlinkATweet app lets you control blink(1) based on Twitter keyword search or Twitter user post. Q. What other web apps does blink(1) work with?A. Via IFTTT.com, you can link your blink(1) with just about any web service, including blogs, Twitter, email, Google calendar and more! Q. Can I control it from my phone? A. Yes! If your phone can load a web page it can control blink(1). The Blink1Control app on your computer can appear as a web app for your phone or any other network enabled device. Q. Is blink(1) hackable? A. Definitely. The enclosure is openable so you can get at the circuit board. And if you know microcontroller programming, you can modify how blink(1) functions. 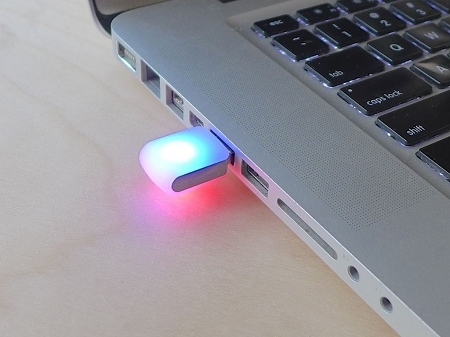 You could even turn the blink(1) into a USB keyboard and mouse emulator! blink(1) is open source hardware, with everything about it on github. Q. I have more questions, where can I go?A. Check the blink(1) website: http://blink1.thingm.com/.